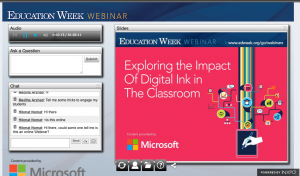 On Thursday, 10/22, the Williston Academic Technology Team of Kim Evelti, Carey Baldwin, and Josh Seamon gave a presentation at MassCUE 2015 on digital ink in the classroom. We were very happy with how the presentation went! You can view and download our presentation slides right here. IDC recently conducted a K-12 teacher survey on their use of technology in the classroom, and specifically their use of a stylus-based device as a teaching tool. Of the teachers using a digital inking device, 90 percent reported improved quality of curriculum materials, and 67 percent said it increased class preparation time. With an ever-increasing range of classroom device options, school leaders should consider devices that will most directly support authentic and efficient student-teacher engagement and reduce time spent on nonteaching-related activities. 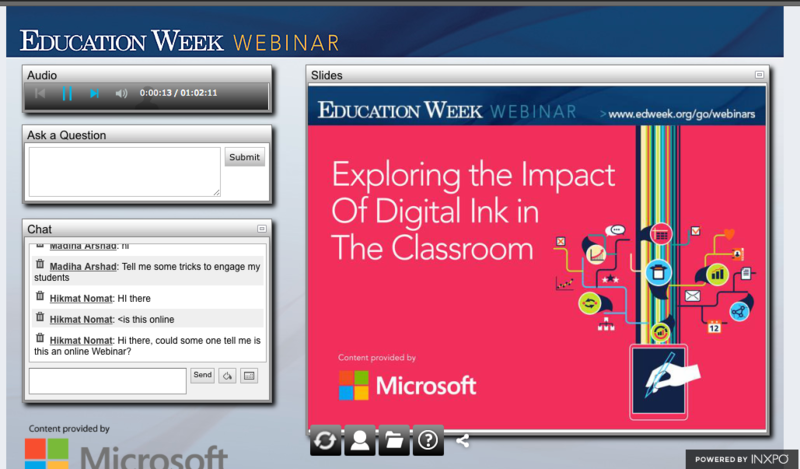 In this webinar, you’ll learn about teacher-reported benefits on using ink in the classroom and how it enables instant student feedback at the “teachable moment.” Hear how using a device with an active stylus provides the personalization and flexibility of a pen and paper, and the immediacy of instant messaging to open and maintain personal connections at the precise moment students would be receptive to feedback, thus enabling better learning. Microsoft just announced a few updates to the OneNote Class Notebook system, including the ability to remove students and teachers from notebooks!